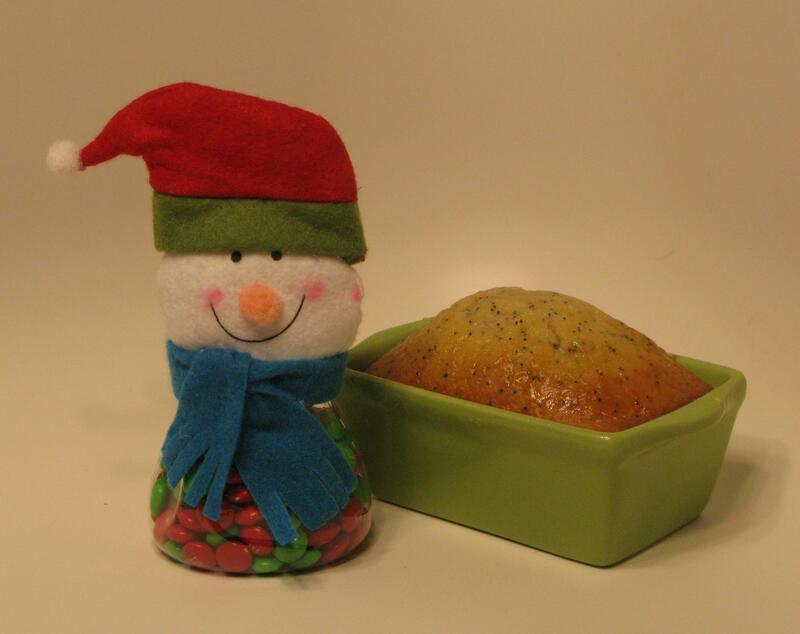 In the above picture, the little snowman is a small plastic container I picked up at the Dollar Store, and filled it with green and red M&M’s. Kids usually seem happy to receive chocolate, so this is a great little individual gift that you can put all kinds of different candies in. The lemon poppyseed loaf was actually given to us by my husband’s aunt and uncle. The loaf pan is ceramic, and super cute! Perfect amount for us to have some slices with our morning coffee. There are so many options when it comes to variety. Usually when I put together gift baskets or tins, sticking with items that only need to be stored at room temperature keeps it simple, rather than forgetting to tell someone that their edible gifts need to be stored in the fridge…and sometimes those results can end badly. Yikes! 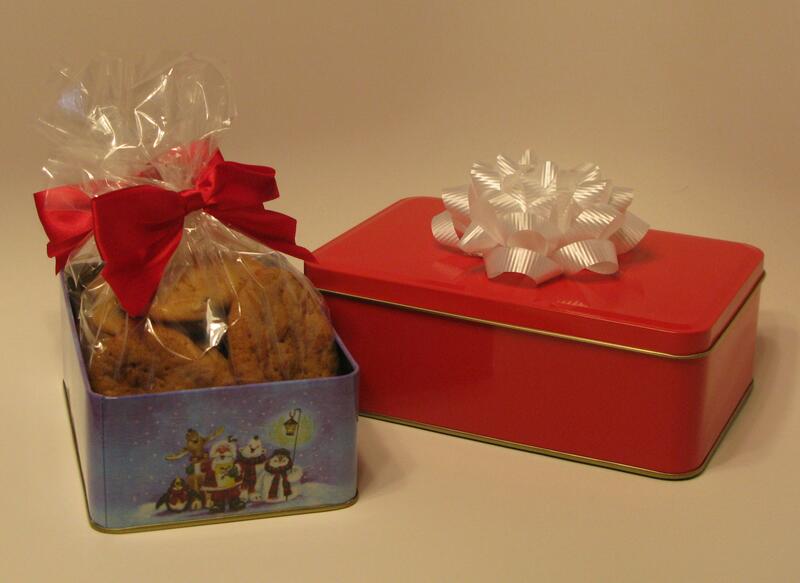 These tins were picked up at the Dollar Store, then I stuck a bow on top of the red tin, then packaged some cookies in plastic treat bags, and tied with a twistie tie bow. If you want to get really creative, like my sister-in-law does for her employees every year, you could do something like this. 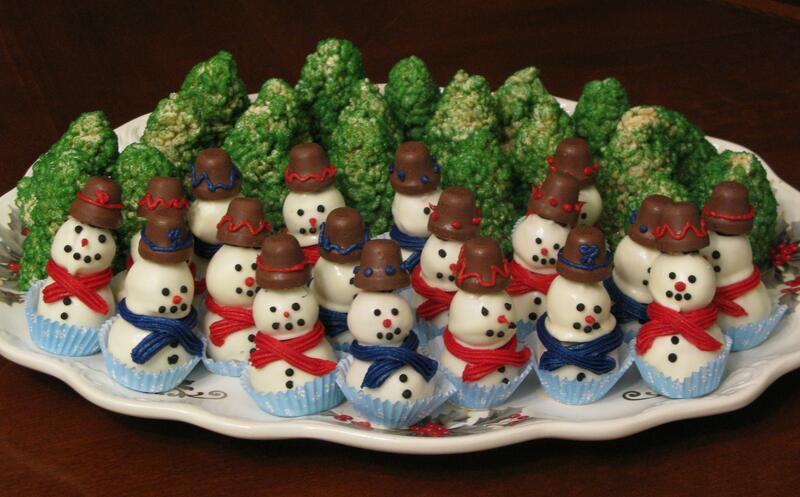 Here, she made rice krispie treats, shaped them in the form of Christmas trees, then sprinkled them with green sugar crystals. 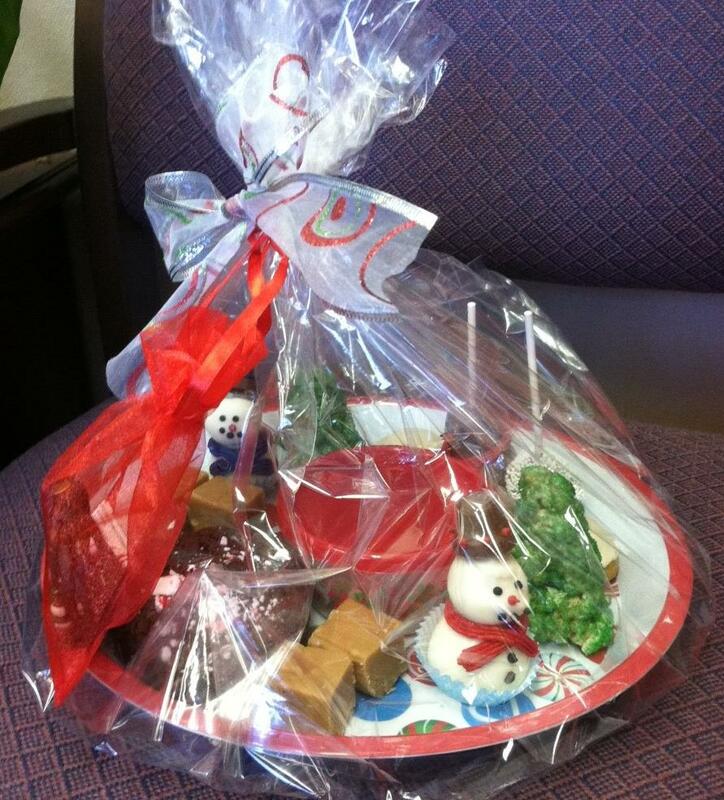 And the cake balls…oh, the cake balls. She did two different flavors, which is why some are red and some are blue (to distinguish the different flavors, of course). When she told me she was baking last weekend and would love some help, I headed on over there. While our kids played together and stalked us in the kitchen, I helped her with these little snowmen. We used two different sized cookie scoops (small and medium) for the different sizes. After we scooped out an even number of each size and stuck them on parchment paper, they went in the fridge to set. Then, we rolled them into smooth little balls, dipped the larger one in melted chocolate with the toothpick sticking out, dipped the smaller ones and didn’t leave the toothpick in, then stuck them together. She used the Reese’s peanut butter bells (seasonal item) as the hats, and piped on the rest of the decorations with colored icing. 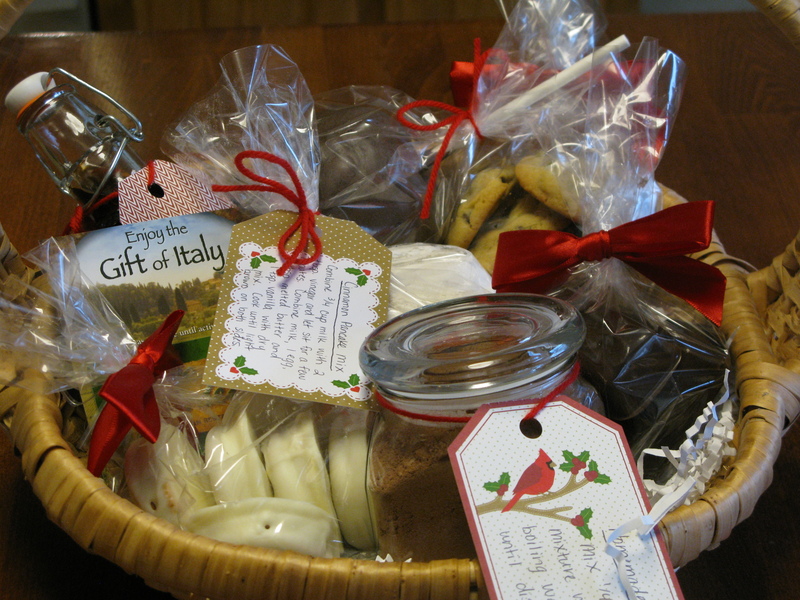 In this particular basket above, I made this for my mother-in-law last year. It has homemade mocha hot chocolate mix, fluffy pancake mix (dry ingredients with instructions), homemade coffee liquor, peanut butter ritz cookies, dark chocolate covered apples, s’mores candy bars, a gift certificate to her favorite restaurant, and chocolate chip cookies. If you’re going to a family gathering and you need to take something, a trifle is always a wonderful item to take. I’ve had many people rant and rave over the Tiramisu Trifle and Oreo Trifle that have shown up at different events…and for good reason! They are absolutely delicious! 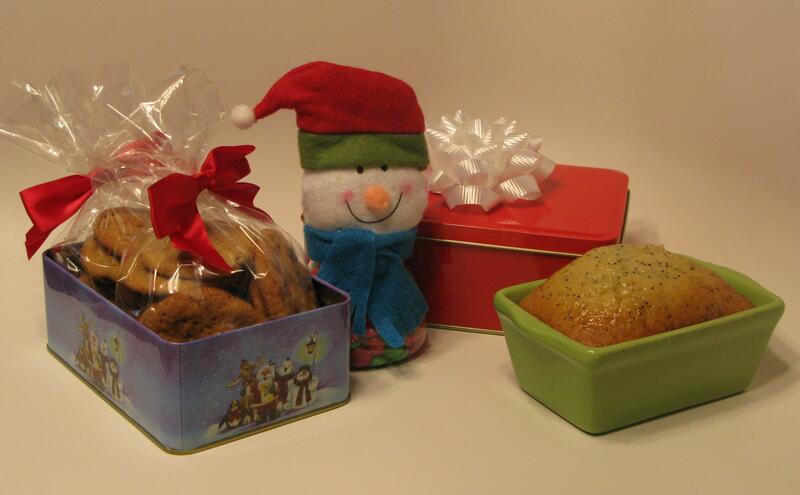 Again, one of the many things I personally love about these edible gifts is the fact that the options are endless. You could pick just a few items and make a few small tins, or you could go all out and make tons and tons of stuff, like my grandmother has done for years. 😉 Either way, you end up with happy gift recipients!